While the 1954 Kaiser Darrin was the first (low) production car with doors that slid into the front fender wells, the prototype of the design was made in Britain five years earlier. Granted, the car built by British Insurance Officer Sidney Nobbs in 1949 wasn't that smart as its sliding door wasted valuable space at the rear. Still, with suicide doors on the passenger side that eliminated the B-pillar and a sliding solution replacing the driver's traditional door mechanism, Nobbs claimed to have came up with a safer automobile offering improved comfort. Howard "Dutch" Darrin's idea for Kaiser Motors' new sports car was much better. 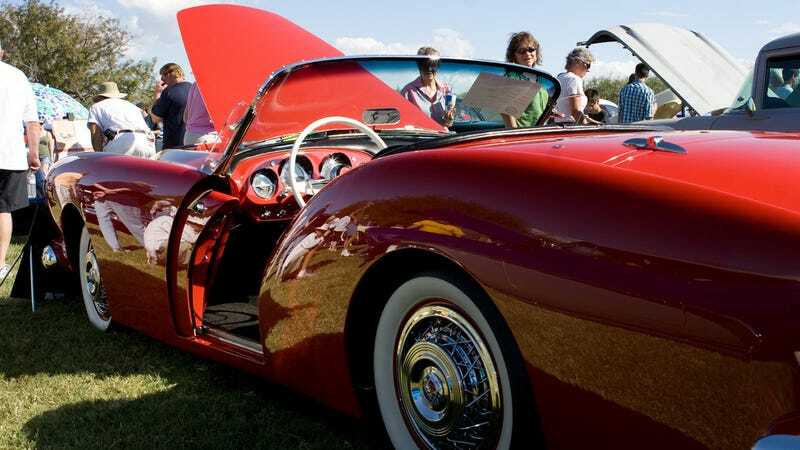 Built on the Kaiser-Frazer Henry J's compact platform and being ready roughly a year before the first Corvette, the Darrin prototype was the first American car equipped with a fiberglass body. What's more, it came with what they called "pocket doors". BMW went for a similar idea on the Z1 in 1989, only vertically. Kaiser only built 441 Darrins including the six prototypes, and after they were done, the sliding door idea stayed in the drawer for almost a decade. It was transformed into a usable design by Volkswagen in 1964. Fourteen years after the Type 2's introduction, the van became available with optional sliding doors for the passenger/cargo area. Of course their sliding doors came with a three-point suspension and opened outwards to maximize the loading space. They were only slightly more expensive. Photo credit: Carbo Productions, aldenjewell and VW via The Samba.